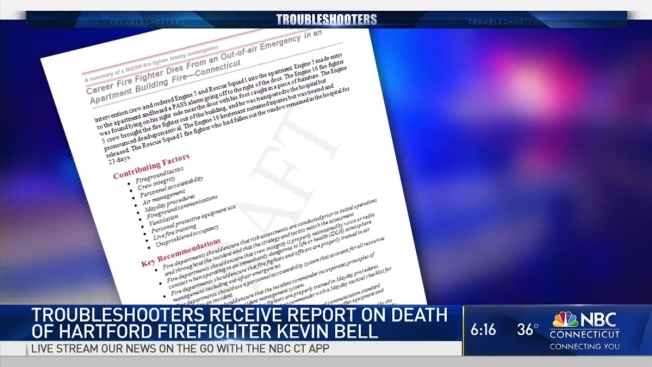 It’s been more than two years since Hartford Firefighter Kevin Bell was killed in the line of duty, and the NBC Connecticut Troubleshooters have a look at the National Institute for Occupational Safety and Health Fire Fighter Fatality Investigation report into his death. The report still has yet to be finalized and released publicly. Its purpose is not to assign blame, but get a description and circumstances leading to Bell’s death, to prevent this from happening again. The Hartford Fire Department had the opportunity to review this 40-plus page document and submit any changes deemed necessary. The report is dated last September, and was submitted to Hartford Fire Department for review. They returned the documents to the Centers for Disease Control and Prevention within weeks, and without changes. Bell died when his tank ran out of air battling a blaze on Blue Hills Avenue back in October 2014, according to the Medical Examiner. The report outlines contributing factors NIOSH investigators believe led to Bell’s death, including fireground tactics, crew integrity, personal accountability, air management, mayday procedures, communications, and ventilation and equipment. The NIOSH report makes more than a dozen recommendations, including making sure risk assessments are done before and during fires, and that departments ensure crew integrity through voice and radio contact. Bell was separated from his lieutenant after his low-air alarm went off and that lieutenant said to exit. After a search and attempt to contact Bell, the lieutenant then called a Mayday that went unheard. Another recommendation: make sure all firefighters are properly trained in air management, mayday procedures, and command safety. Also, enforcing protective hoods – which weren’t required at the time, resulting in a handful of firefighters being hit by a hose stream that knocked their helmets off. The hoods are now a requirement. Investigation revealed that Bell’s equipment failed the remaining service life indicator test, but passed all other NIOSH test. Bell was found by fellow firefighter lying near a second floor door, his right leg and foot caught in a piece of wrought iron furniture. At the end of this report, NIOSH officials chose not to impose any further action. The NBC Connecticut Troubleshooters received no comment from Hartford’s fire chief, and did not hear back from a Bell family spokesman, a Bell family attorney or the head of the union.